Thursday, Sept. 13th- Leave MCM/Shelby Twsp. Travel via Blue Water Bridge to MINI of Waterloo Ontario (lunch), follow on to Tobermory. Arrive @ Tobermory late afternoon. 1st night stay Tobermory. Friday, Sept. 14th- Tobermory to Sault Ste Marie USA. Ferry time TBD, option early morning boat leaves Tobermory 8:50 am. Arrive South Baymouth 10:50 am. Drive time from South Baymouth to Sault Ste Marie 4.5 hrs. ETA 3:40 pm. Ferry Time 1:30 pm. Arrive in South Baymouth 3:30 pm. 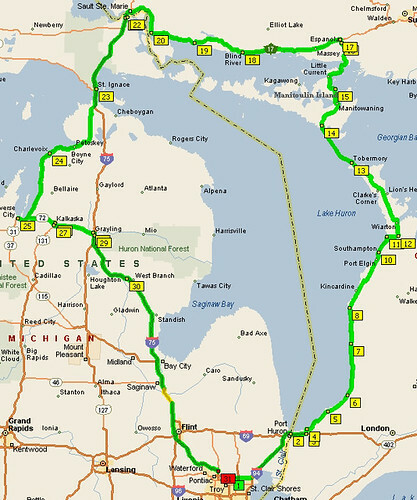 Drive to Sault Ste Marie 4.5 hours ETA 8:00 pm. Saturday, Sept. 15th- Free day to explore the area / meander to final destination in Traverse City. Points of interest and itinerary. Drives around the area in the UP. Picturesque Drives to Traverse City.